Essaouira spreads along a long sandy strip of Morocco's Atlantic coast. The kind of place you'd imagine Peter O'Toole's Laurence of Arabia riding in to from the desert. Definitely Moroccan, but with a European familiarity - it was designed by a Frenchman. What wouldn't work for Toole's Laurence is the air full of windsurfers and kitesurfers. Some of the best places to stay in Essaouira cater for this crowd, but most are ideal for those who are here for more than the waves. The powerful and constant wind, the locals call it alizee or taros, which makes this sunny, sandy destination unpleasant for people who want to sit on the beach, makes Essaouira heaven for windsurfers and kitesurfers. And in a way it's these active travellers who've helped protect Essaouira's natural charms from becoming over touristy. Today the busy medina is just as important a market place as it ever was. This port is not just a pretty museum to its past life, it's still vibrant. Essaouira's protected natural harbour made it an important trade route, hence the massive medina. The labyrinth of streets has been famously recorded by many and is a delightful tangle of treasure - and a nightmare for cars - so visitors are forced to navigate the same pathways as the sugar pirates who influenced the layout of the town. The beach is long, curving and quiet and the hotels are – generally – more boutique one-offs than Travelodge, so the vibe is more independent traveller than tour group. The streets are too narrow for those big buses. It's only from the outside that Essaouira looks European, within the narrow alleyways permeated by spicy smells whipped around by the wind it feels very Moroccan. As well as the spices and the smell of the sea the air is filled with the sounds of Gnawa singing. Essaouira actually means 'beautifully designed small fort', so it follows that the old fort is one of the city's main attractions. This fortress originally protected the surrounding town and the harbour. The medinas and souks are the other main attractions. The working fishing harbour and tiny woodwork factories are also fascinating. There's a wonderful art scene - artists have been coming here for years because of the wonderful light. This is also a great place to visit in winter, when it's quieter and many of the best places to stay in Essaouira are not so busy. For those who like watching windsurfing, as well as going windsurfing, Madada Mogador is should tick all the boxes, if only for the roof terrace which has sweeping views over the stunning beach. There's also a good restaurant which runs cooking classes. 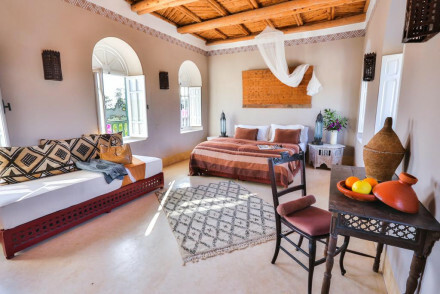 Dar Liouba used to be an Imam's residence and the seven comfortable, sunny, whitewashed rooms can all be booked together making this one of the best places to stay in Essaouira for groups. They also offer windsurfing or kitesurfing specific packages. 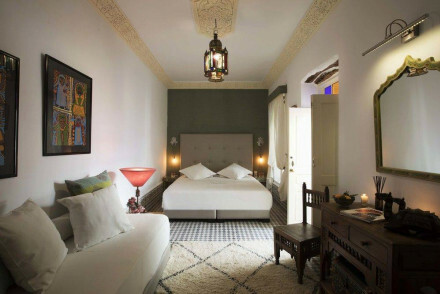 If you love the idea of staying in a riad, this 18th Century boutique version just minutes from the beach and the golf courses is probably for you. As well as being a romantic blend of traditional and colonial decor, the Villa de l'O is close to both the beach and the souks and has wonderful sea views from the rooftop terrace, which also overlooks the old town's battlements. 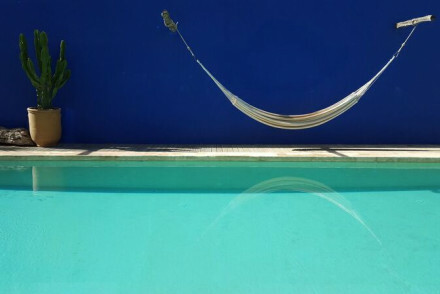 Casa Lila is a great choice if you're looking for Moroccan sun on a budget - rooms start from around €75 per night,and some of the large rooms sleep up to four. The reasonable price doesn't mean Casa Lila is a plain Jane, she's charming and traditional, but not always in the colours you'd consider traditional Moroccan - making this a really unique place to stay. 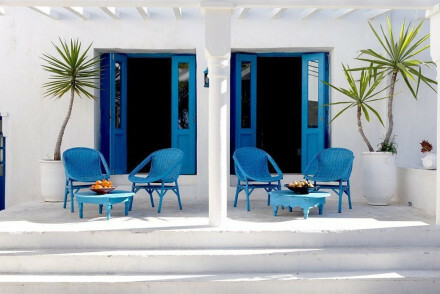 For something more modern try Riad Lotus O Marine. Its luxury includes modern art and even more modern lighting. And if you want to hang where Hendrix and Marley hung, book in to Heure Bleue. Who knows what convinced them this was the best place to stay in Essaouira? Was it the roof top terrace and pool? Was it the cinema onsite, or the multiple restaurants which also run cooking classes? Or the location, near the gates of the medina and just minutes from the beach? Or maybe it was the fact that it was originally the home of Caid Mbark Saidi? 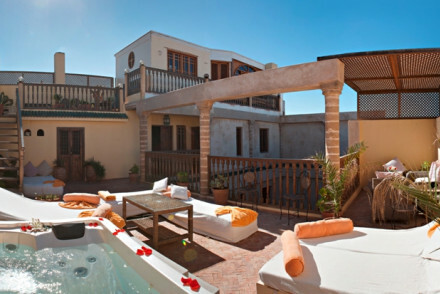 Rebali Riads is a villa style resort on the coast about half an hour outside Essaouira. The accommodation is spacious - some villas have their own pools - and there are excellent facilities for guests of all ages. 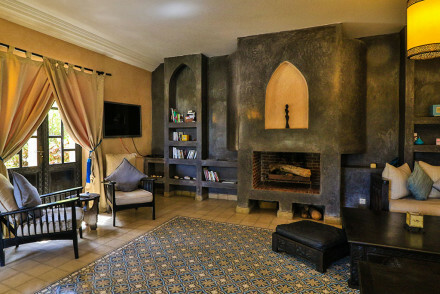 The Riad Chbanate is discreetly located in a quiet spot by the Medina boundary wall. There are eight rooms with impressive bathrooms, plus friendly staff and a resident turtle. If you're here for the history book into Dar L'Oussia, which is situated in the old ramparts. As well as the historic location these 23 rooms and fours suites ooze heritage. From the four poster beds to the art, to the wonderful inside courtyards and romantic balconies overlooking them. La Perle d’Eau is in an unbeatable waterfront location overlooking the Atlantic. There are just eight individually designed rooms and suites. The hosts are helpful and the atmosphere is of comfort and elegance. 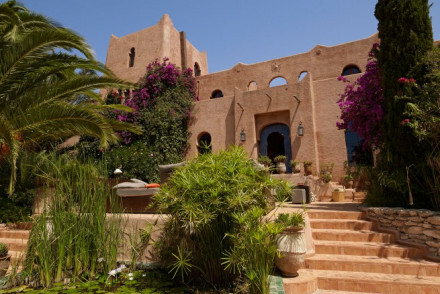 Dar Maya is a luxurious five room riad with a fantastic roof top terrace bar, pool and excellent restaurant. There’s also a hammam and traditional Moroccan details. Les Jardins de Villa Maroc is a charming, rural property with suites and studios with a layout perfect for groups and families. There’s also an excellent entertainment area, a restaurant on site and two pools. Dar Lazuli is a Belgian owned guesthouse with three self-contained suites which are ideal for families. Or you could take over the whole property! Rooms start from only €65 per night. The Villa Gonatouki is an impressive guesthouse ideal for families and groups. 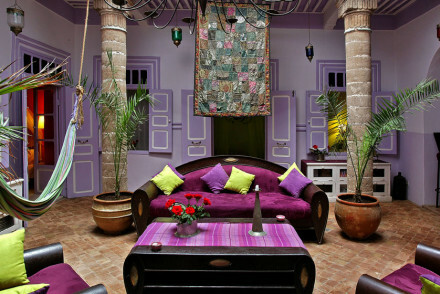 It has just ten rooms, decorated in a welcoming, bohemian style in a colourful palette, plus a hammam and two pools. It’s a palatial feeling villa but the atmosphere is informal. 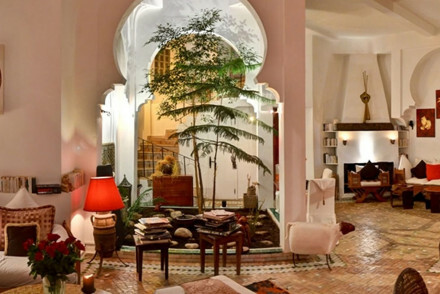 The Villa Maroc is a guesthouse converted from four riads in the heart of the medina. As well as the great location, this villa offer 21 rooms in a great configuration for both families and couples. 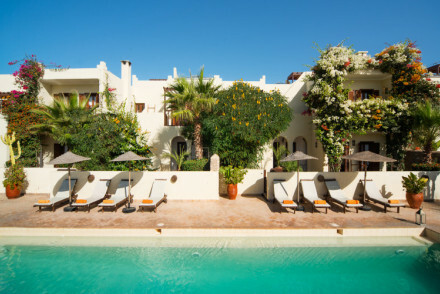 Le Jardin des Douars is a fantastic 26 room oasis on the edge of Essaouira with beautiful gardens and traditional Moroccan decor. There are suites and a villa sleeping up to ten, plus sprawling terraces, a spa and an excellent North African/ French restaurant. The Essaouira Lodge has 34 rooms and generously sized and welcoming public spaces - so it’s a great place for groups or families to congregate. It’s outside of town so the price is very reasonable, with rooms starting from €70 per night. 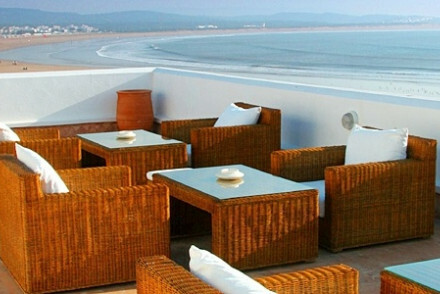 For around the same price you could consider Dar Sahil which has just six rooms and two suites. 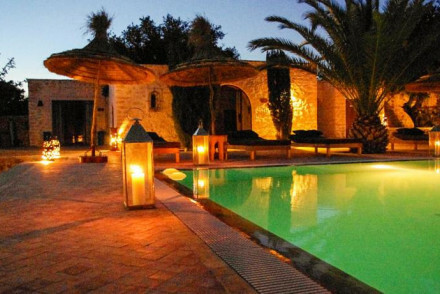 Also just outside town, this traditional Berber house is surrounded by beautiful countryside and has a great pool and you’re right beside a golf course which has been described by ‘Golf World Magazine’ as being one of the world’s ten most beautiful. 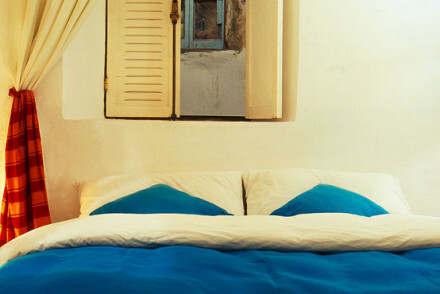 For great value in town, try the Riad Baladin a ten room riad with a chic, yet bohemian vibe and bright, airy rooms. There’s a funky restaurant and hot tub and you’re just minutes from the beach. 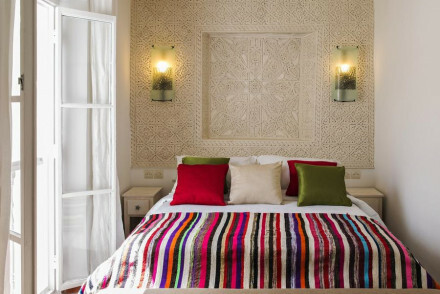 With rooms starting from €85 per night including breakfast, Riad Baoussala is a small riad with rooms, suites and a cottage sleeping up to five all arranged around a pretty courtyard, There’s also a gorgeous pool. Essaouira airport is ten miles out of town and you can catch an airport shuttle bus for around 6 dirhams, or take a taxi for around 150dirhams. Marrakech airport is about two and a half hours away and has a larger range of connections. Essaouira’s average maximum temperatures don’t fluctuate too much throughout the year, with the peak in July at 22°C and the trough in January at 17°C. 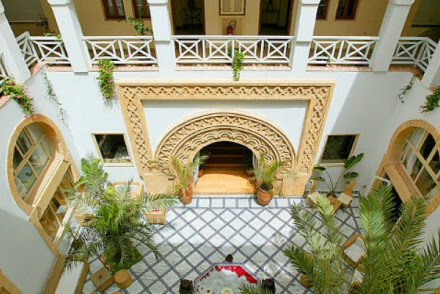 French-run medina riad in a popular part of town with 9 well proportioned rooms and a lovely sheltered roof terrace. Deliciously innovative food and well staffed. Local markets - Just miss out on the bustling madness of the city's souk. Understated hippie chic that will appeal to couples looking for a serene, zen vibe. Light and bright airy white-washed rooms overlook a courtyard or one of several terraces. Bathrooms are ornately tiled, some compact. There is a funky restaurant and a hot tub. The beach is moments away. Romantic Break - Light and airy rooms have a whimsical feel, perfect for romance. Value chic - Achingly beautiful interiors at an inviting price. Sights nearby - The ancient Essaouira Citadel is moments away. Self-catering apartments by the sea with lovely views. All are individually furnished and are mostly in an easy open-plan layout. Expect traditional Moroccan accents, cosy nooks, whitewashed walls and roll-top baths. A delightful base with a luxurious yet homely feel; it's great-value too. 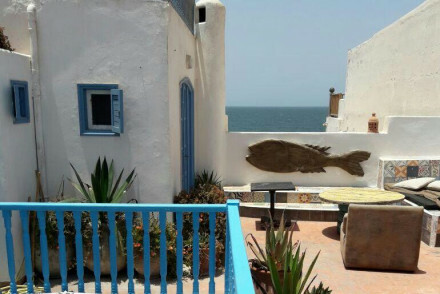 Belgian owned guesthouse with three self-contained suites in a good location, close to both beach and medina. A simple place for groups or a family who might want to take over the whole property. Meals provided. Looming large on the horizon this impressive guesthouse caters for couples, families and large groups. Bohemian rooms are decorated in colourful palettes and chunky furnishings. There is a hammam plus massage and two pools. Great service in a palatial place with an informal atmosphere. Swimming Pool - Outdoor and plus villas with private pools. 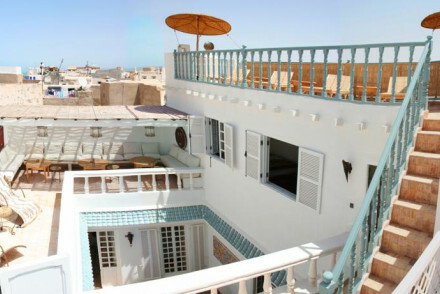 Completely charming traditional riad with romantic rooms and suites. 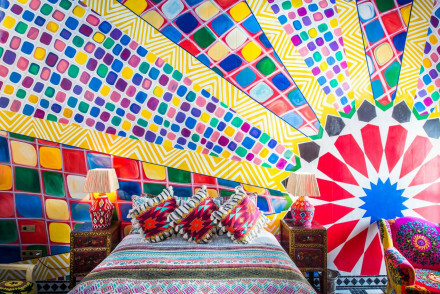 Colour themed rooms in pastels with chequered floors, whimsical furnishings, and Moroccan art. Lovely terrace, alcoves and roof terrace for sun bathing. A romantic spot, also family friendly. Blissful peace awaits those lucky enough to get a room at this hidden four-room chambres d'Hôtes/boutique B&B. A calm, sensitively designed interior plays host to work by local artists. Breakfast and dinner can be enjoyed on site and picnics are offered too. Traditional Berber house just outside Essaouira surrounded by beautiful countryside. Six room and two suites furnished in classic style with carved wooden headboards and tiled floors. There's a lovely pool for cooling off and wonderful Moroccan dinners created from the market's best ingredients. Value chic - Unbeatable value. Rooms start from just €55 per night. A beautiful boutique riad in the old ramparts. It oozes heritage and traditional romance. Sunny rooms and suites all in creams with four poster beds, artworks, and balconies onto the inner courtyards. 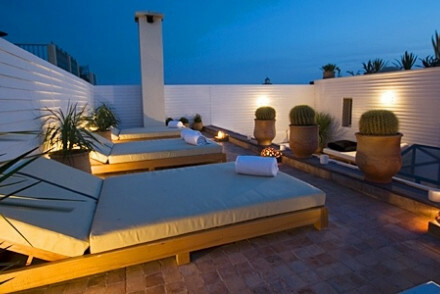 Fantastic roof top terrace and great Moroccan restaurant. A great value spot for couples. A charming rural property that works for families, groups or couples. Attractive accommodation to the east of Essaouira, with suites and studios, plus two outdoor pools, an excellent entertainment area and spa/hammam ensure something for everyone. The restaurant serves delicious local cuisine. House party feel - With its large entertaining spaces, come with friends and make this a home from home. An unbeatable waterfront location overlooking the Atlantic. Just eight individually designed rooms and suites offer comfortable, spoiling accommodation with stunning views. Helpful hosts will organise your activities and advise on eating out. An elegant stay in one of the best spots in town. 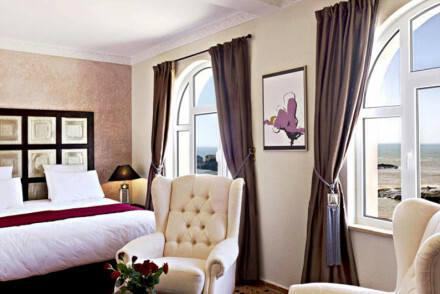 Value chic - Double rooms start from as little as €90 per night including breakfast. Sights nearby - Situated in the heart of the Old Town, close to all major attractions. 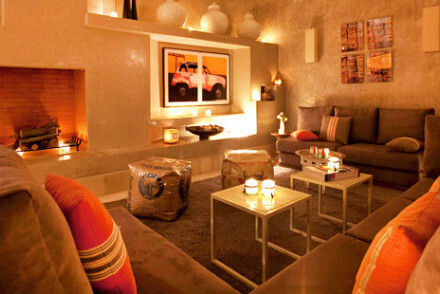 In the NW part of the medina, this is one of the more chic and discreet Essaouiran retreats. Guests are treated to seclusion, contemporary comfort, spacious tadelakt rooms & bathrooms, private balconies and a lovely roof terrace with jacuzzi. A romantic spot for two. Sights nearby - Situated in the heart of the Medina, minutes from all the major attractions. 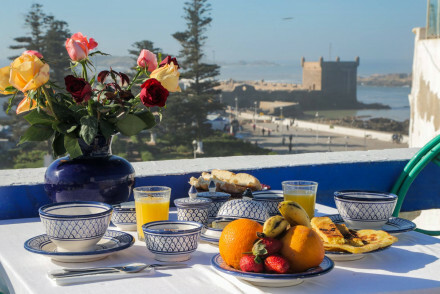 A fantastic oasis of beautiful gardens, traditional-chic Moroccan suites, sprawling terraces, excellent North African/French cuisine, and spa - on the edge of Essaouira. A great example of Moroccan tradition and French-chic. A great venue for a private party with a "Wow factor". Garden - Spectacular gardens filled with argan trees. Charming, intimate riad just outside Essaouira. Rooms, suites and 2 cottages sleep up to 6 are arranged around a pretty courtyard. Decor is traditional & calming and each room is individually designed. A gorgeous pool (heated in winter) is perfect for relaxing after a day exploring or on the beach. Value chic - With rooms starting from just €100 per night including breakfast, it's excellent value for money. Sights nearby - Just 9km from Essaouira, or even shorter by track! Charming, informal hotel close to Essaouira where guests stay in simple bungalows. A hotel in a former family palace with a charming garden and pool. Beautifully furnished interiors have lots of cosy nooks to relax in and feature gorgeous Moroccan tilework, intricate stucco and carved wood. Elegant rooms have opulent fabrics and fine cedar furniture. A luxurious treat! Foodies, luxe detailists and style lovers will enjoy the experience of staying here - where good smells, beautiful views and delicious food unite to make for an exotic sensory experience. Popular cookery workshops on site. Roof terrace - Wonderful panoramic views of the city. Cooking classes - Moroccan Cookery Classes are held daily in the funky Atelier Madada. 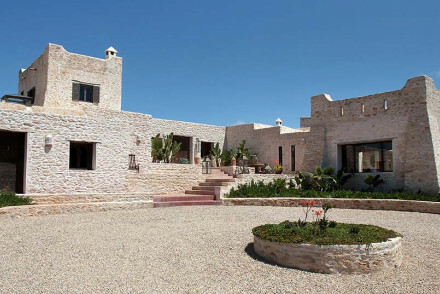 Enchanting stone built Moroccan Beldi farmhouse 20 minutes outside Essaouira with a meticulously designed interior. Owned by ex-New York fashion stylist, there are 7 lovely bedrooms, a collonaded indoor Roman-style pool and plenty of space to relax - in and outdoors. Perfect for a romantic getaway. 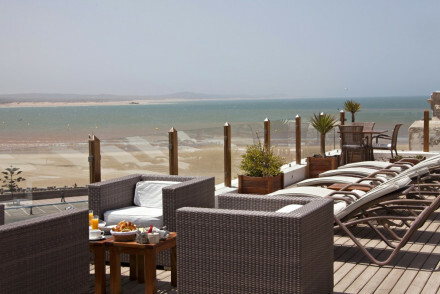 Superb villa style family friendly resort on the coast about half an hour from Essaouira. Spacious acommodation in traditional style villas some with private pool. Excellent facilities for all ages and a personal dining service enabling you eat where you please! A wonderful laid back beach holiday. 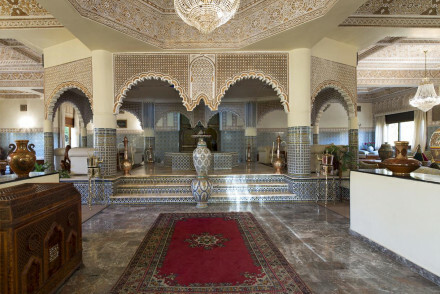 Value chic - With rooms from just €120 per night including breakfast, Rebali Riads is superb value. Cooking classes - Accompany the chef to the souk then cook up the spoils together. Swimming Pool - There are five outdoor pools, two communal and three private. 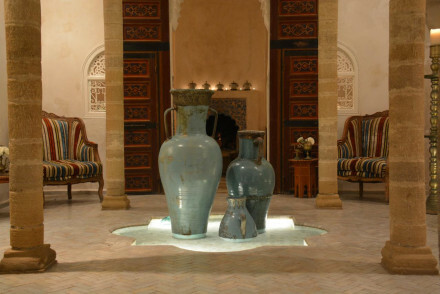 A fabulous 18th century boutique riad in a perfect location - minutes from the beach and the golf course. Sand stone columns, sculpted woods, and beautiful fabrics blend oriental tradition and western luxury. A lovely roof terrace has stunning coastal views. A luxurious treat. Romantic Break - A lovers retreat- elegant suites ooze grown up style, while the roof terrace offers the best views of anywhere in town. Active Holiday - Essaouira is a hot spot for outdoor activities particularly windsurfing and kitesurfing. Sights nearby - Make sure to explore the sights of the city, especially to the art galleries, museums and fishing harbour. Local markets - Explore Essaouira's souks, packed with beautiful handicrafts and local produce. 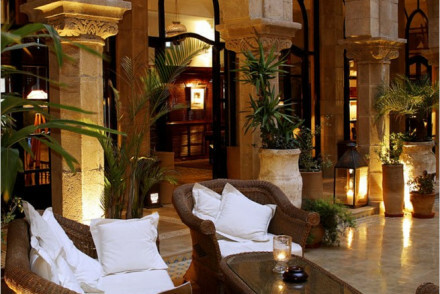 A charmingly ostentatious hotel in a prime spot in the Medina. The quirky roof terrace offers great sea views, while the eclectic interiors are an ode to the tradition of Moroccan hand-cut tiles, with a frenzy of colourful, repeating geometric patterns and jazzy furniture. A truly original base! A stylish boutique hotel with retro rooms, excellent restaurant, spa, and rooftop terrace. Eclectic rooms and suites filled with modern art, luscious fabrics, and modern lighting. A great choice for couples. 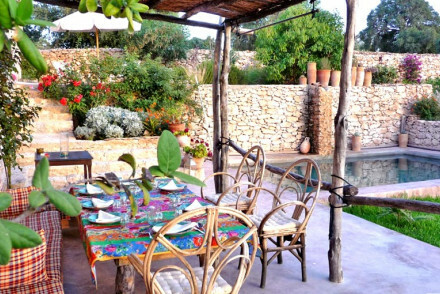 Magical rustic hideaway not far from Essaouira. A unique and authentic place to completely unwind in nature. For those who don't mind simplicity, low doorways and a quirky layout. Great walks - There are lovely walks close by and you are welcome to take the owner's dog with you! Chic - Previous hang out of Hendrix and Marley. Swimming Pool - Fantastic roof top pool.